A rise in interest rates last week may have prompted would-be refinancers and home buyers to pause. 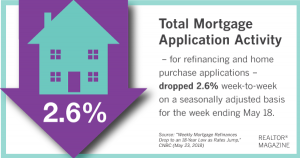 Mortgage applications—for both refinancings and home purchases—dropped 2.6 percent last week on a seasonally adjusted basis, the Mortgage Bankers Association reported Wednesday. Mortgage volume is now 10.5 percent lower than a year ago. The 30-year fixed-rate mortgage rose to its highest level since April 2011 last week—a 4.86 percent average, MBA reports. The higher rates gave homeowners less incentive to refinance. Refinance volume dropped another 4 percent last week and is now at the lowest level since December 2000. Refinance applications are 27 percent lower than a year ago. That’s caused lenders to put more weight behind their home-purchase business, but the higher rates—mixed with a severe shortage of homes for sale—appear to be limiting the buyer pool there, too. Mortgage applications to purchase a home dropped 2 percent for the week. However, volume is still 3 percent higher than a year ago. “Purchase applications decreased over the week, while the average loan amount for purchase loans increased to over $320,000 after averaging around $317,000 for the past four weeks—likely a sign that inventory for lower-priced homes remains low and the mix is still skewed toward larger loan balances,” says Joel Kan, an MBA economist.